How? How did it get here so fast? I just had to adjust my wording as to avoid a “THAT’S WHAT SHE SAID” moment (teehee!). Well I guess in a few hours we’ll all see if we’re still alive or if the Mayans were right. In the meantime, I’ll be eating a bunch of oliebollen and practicing Nutmeg, my little ukulele. I can’t remember a year where we haven’t made them. It’s a fun tradition and one that I will carry on into my own family one day. Sweet baby jesus are they ever good! I think these are the best ones that I’ve ever made. Look at that fluffiness! They don’t feel greasy or heavy at all, and they aren’t overly sweet. There’s only 3 tablespoons of sugar in the dough and the other sweetness comes from the apples and the sugar that they get rolled in, but if you’re crazy for some reason then you don’t have to roll them in sugar. But I will tell you that you’re crazy. 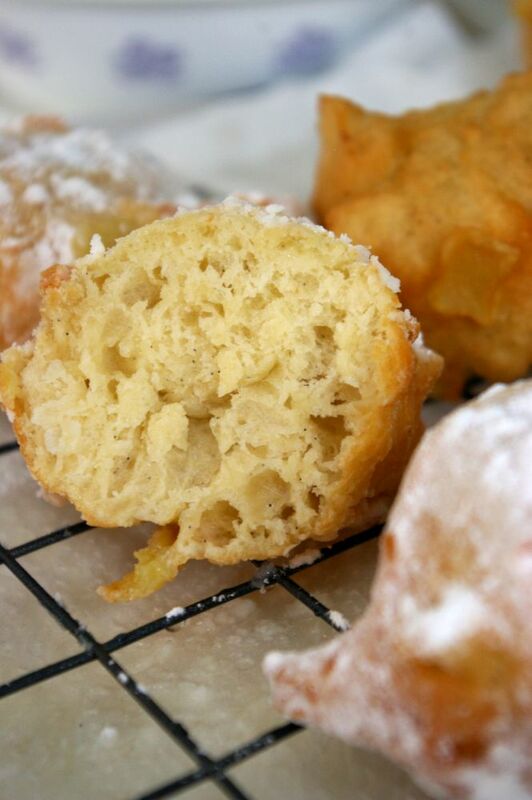 ‘Cause if you’re deep frying doughnuts, you might as well go all the way. Nomnom. 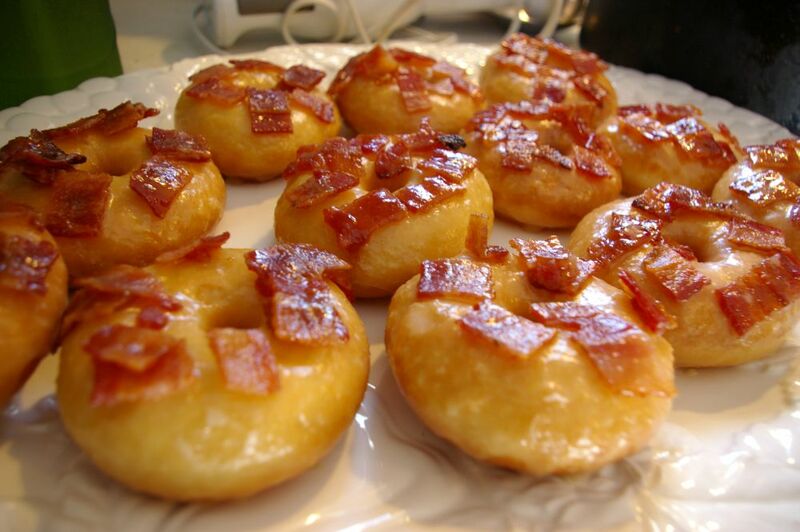 Oh yeah I also made those maple bacon doughnuts again on Boxing day. Weee! 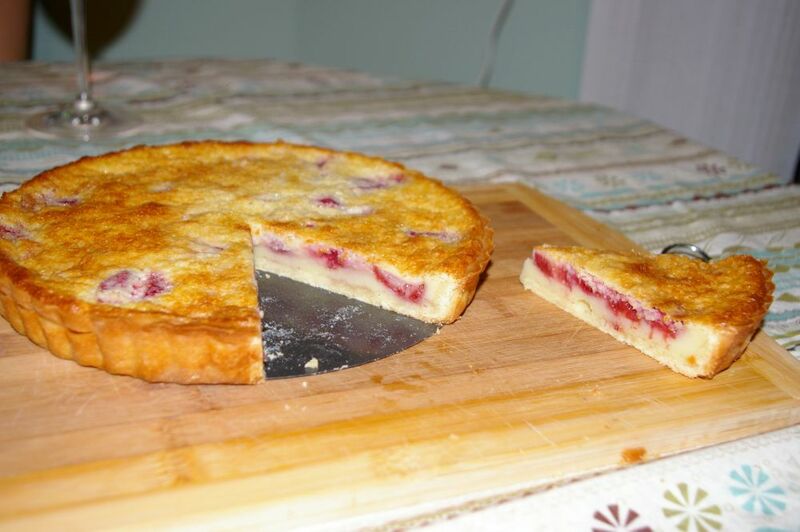 And a strawberry tart as well as a vanilla buttermilk custard cake for Christmas dessert! I’ll type out the recipes and whatnot in a later post so this one isn’t a million words long. Aaaaaaaaand a bunch of other little things, like cookies and gevulde speculaas. Oh wait I have a picture of that one! 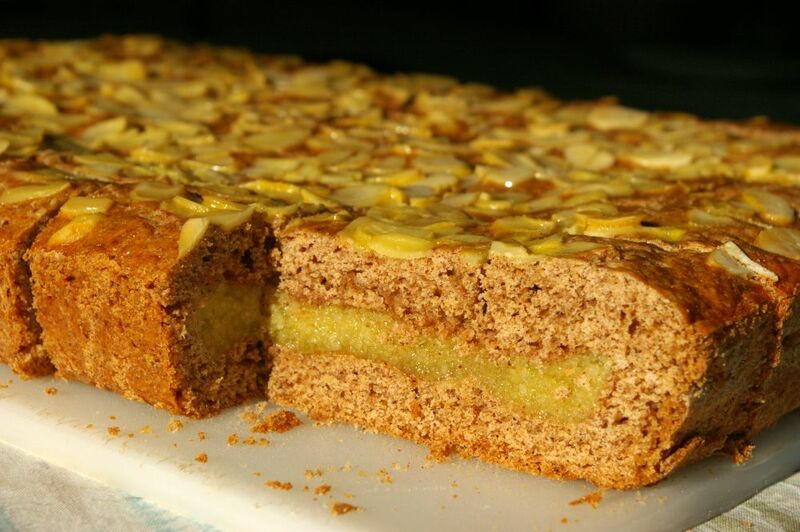 Gevulde speculaas is essentially almond filled speculaas and has a nice spicy taste to it. If you’ve ever had those dutch windmill cookies, those are the same spices. Omnomnom. 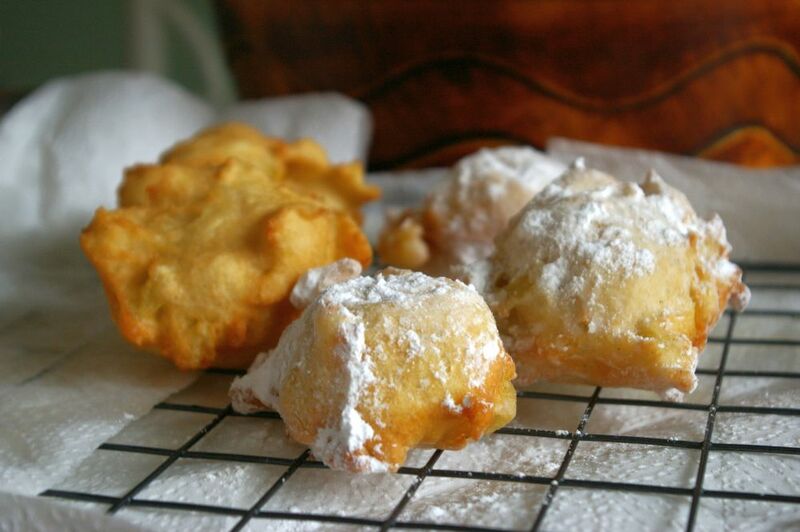 Well here’s the recipe for the Oliebollen! Dissolve the yeast and the sugar in 1/2 cup of the lukewarm milk and let it sit for about 10 minutes until it’s foamy and happy. In a big bowl with a wooden spoon, or in a stand mixer with dough hook attached, mix together the warmed eggs, the rest of the milk, the vanilla, vanilla bean and the salt. 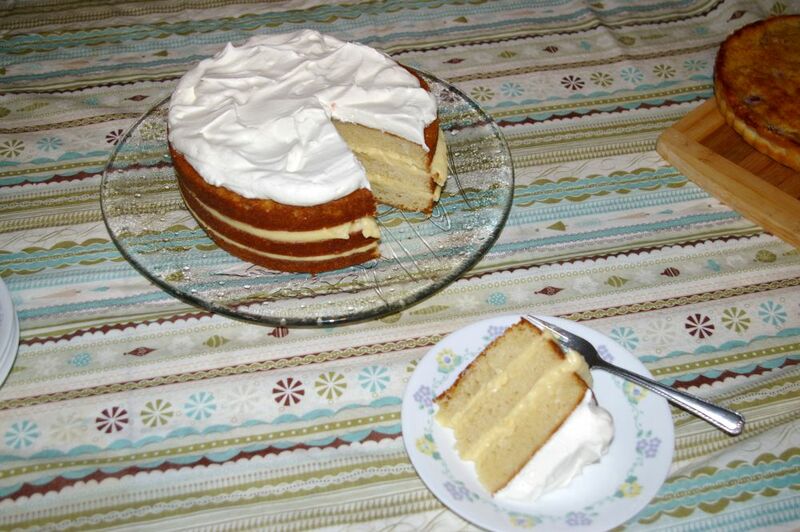 Mix in 1 cup of flour (don’t worry if it’s a bit lumpy). Once the yeast is happy, add it into the bowl and mix. Slowly add the rest of the 3 cups of flour, then add in your apples (raisins too if you want, I suppose. Dried cranberries would be good too. Or currants!). Make sure everything is evenly mixed and then cover the bowl and let it rise in a warm place for 1 and a half hours until it’s huge. Once it has risen, give the bowl a good tap on the counter to deflate it a bit, then start warming up your oil to 370 degrees F. I used a mixture of canola oil and sunflower oil. 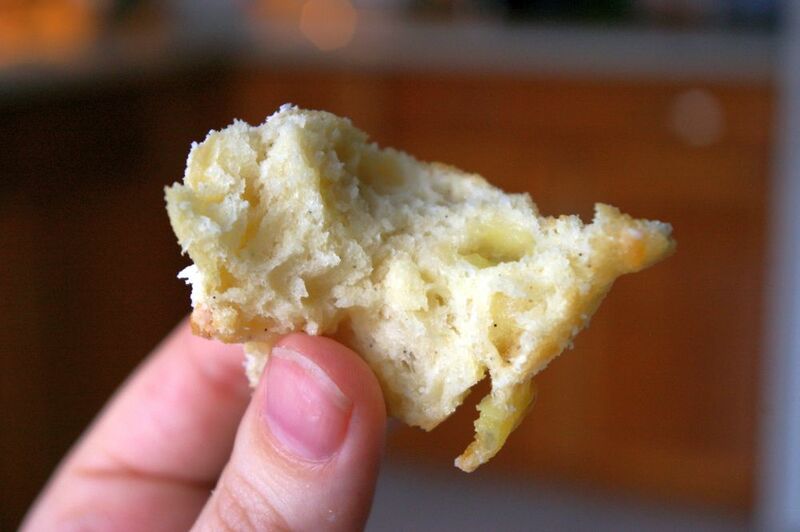 Once the oil is the correct temperature, try your best to drop the sticky dough into the oil using two tablespoons. Most of the oliebollen will flip themselves over when they are ready, I love watching that happen! Continue to fry the other side until they’re lightly browned. They shouldn’t get too brown. Remove them with a slotted spoon or a spider and place onto a cooling rack with paper towel underneath. Once they are cooled enough you can roll them in sugar and eat them! Word of caution: being too eager to eat freshly sugar-rolled oliebollen will result in the accidental inhalation of icing sugar, I’m not even kidding. I do that every year on my first one and cough for a good minute or two, haha. This entry was posted in Cake, Delicious Breakfast Things, Delicious things I think are pretty delicious, Yeasty Deliciousness and tagged dutch doughnuts, new year treats, ohmygodit'sgood, oliebollen. Bookmark the permalink.